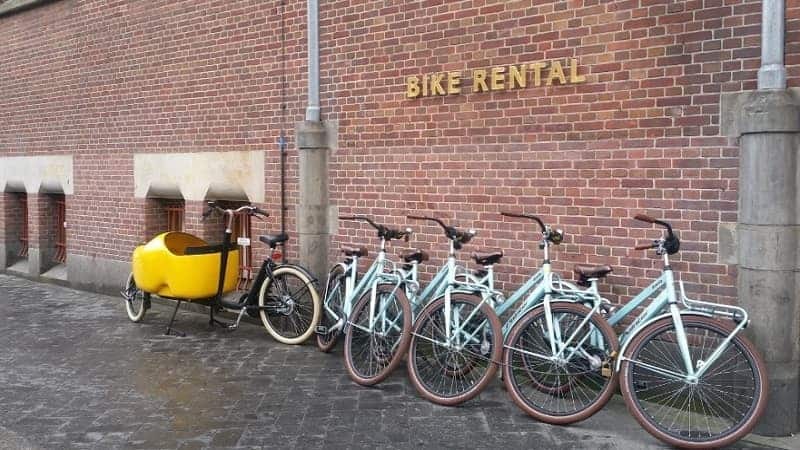 Renting a bike in Amsterdam is well known in the world and there is a good reason for it. It is the cheapest, fastest and most convenient way to transport yourself through the busy city center of Amsterdam. Forget the public transport and taxis and explore the highlights of the city by bike. Enjoy a ride through the Vondelpark or Hortus Botanicus (a garden with more than 4000 different plants and flowers). Or how about a ride through the most lively area of the Netherlands, the Jordan? A perfect place where you can shop in the Nine Streets or you can grab a nice terrace at one of the canals. You can also easily cycle to the various museums such as the renovated Rijksmuseum, Hermitage, Van Gogh Museum, Nemo or the Anne Frank house. You can eve take the bike to The Zaanse Schans, Volendam / Marken and Broek in Waterland. You can rent traditional Dutch bikes with a coaster brake, but if you need a little more comfort try the bikes with handbrakes and gears. You can also rent a bike for kids and child seats for the really young ones (front or back). The rental price is EUR 8,50 per day for a coaster break and EUR 13,50 for hand brake with three gears. Discounts will apply if you rent a bike for multiple days. All rental prices include an insurance with a deductible of EUR 100 for a coaster brake and EUR 150 for a handbrake with three gears. To rent a bike, a deposit is required (e.g., an imprint of a Visa, MasterCard or AMEX card or EUR 150 deposit per bike). Always bring a valid ID!